I have a unique situation with one available puppy. 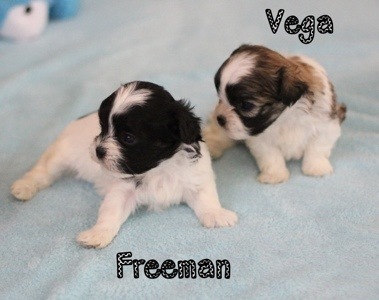 In my efforts to downsize the kennel in preparation for our move, and to focus more on raising Cavachon puppies, I re-homed several ShihTzu females and both of my Maltese males. They now live in the Seattle area and are being raised by a new friend and colleague. One of the females, Missy, had puppies a few weeks ago, and I get one pup from her litter to sell. 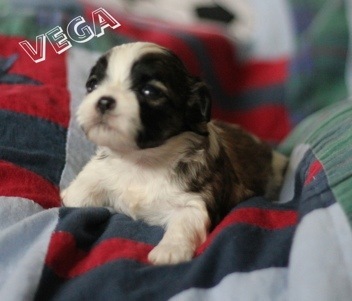 So far, two pups have sold, and Vega, and Rex are still available. 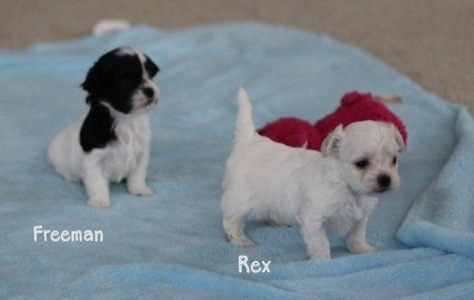 I am offering either one of these puppies for $500, but this offer is only good for the first puppy chosen. I usually sell the Malshi puppies for $850, so this is a great deal for a family looking for a Malshi puppy. They are both males. You can see the entire litter pictured below, but only Vega and Rex are available, as the other two puppies have already found homes. **Moments after posting, I was notified that Vega has also sold. So only REX is available for this offer**!